Click on the map to open in Google Maps. Send us your query anytime. The location for the symposium is in the Boothzaal in the University Library located on the Utrecht Science Park. You will find the Boothzaal to your left after entering the building and climbing the stairs. Take line 12 or 28 from Utrecht Central Station to bus stop 'Heidelberglaan'. The library is located to the right of the HU, in the black building with a bridge extending over the road. 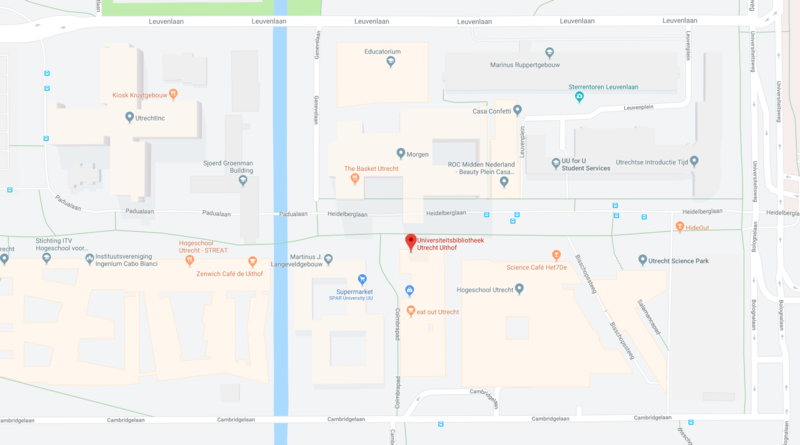 You can get to the Utrecht Science Park by taking exit 2 on the A28. You can park your car at P+R De Uithof. From there you can take the bus to bus stop 'Heidelberglaan'. The schedule has not been finalised yet, but it'll probably start at 11:00 and end at 17:00. There will be free, I repeat, free lunch! Banner image by Julius Horsthuis.